“What are some popular Indian cocktails?”, my friend (Korean) asked as we were sipping our mojitos at the counter of a local sports bar on a game day, wearing maroon, trying hard to understand American college football (because our school was playing). I put down my mojito and stared at her for a few seconds too long. Thinking that I did not hear her over the screams of excited Aggies, she repeated–“what cocktails do you usually drink in India”??? You see, I did hear her the first time. It’s just that her question took me by surprise; it puzzled me. I realized that we do not really have a popular “Indian cocktail”. Indian restaurants, both in India and abroad, will try to infuse regular cocktails with “chai”, ginger, chili peppers, and cilantro, but they are no more Indian than bucks or margaritas. My friend’s question stirred the dormant (possibly unborn) mixologist in me, and I started concocting different Indianized cocktails in my head. My first spirit of choice was obviously gin because it is steeped in Indian colonial history as evident from the bottle of Bombay Sapphire. The gin and tonic cocktail was first introduced in India by the East India Company. The British Raj, concerned for the health of British soldiers in India during the outbreak of malaria in the 19th century, rationed Indian tonic water and gin to the soldiers, which were then used to administer quinine to the afflicted soldiers by making the bitter medicine more palatable. But other than its history, gin and tonic isn’t really Indian, flavor wise. If there is a completely Desi (Indian/Pakistani/Bangladeshi) drink, other than tea, then it has to be fresh lime soda with jal-jeera (a spice blend of cumin, rock salt, mint, etc). This is what we Desis drink universally. Masala fresh lime soda is to Desis what Coke is to Americans. That’s the first thing we order at any restaurant, at anytime, during any season. So the obvious answer to my friend’s question would be “Desi Gimlet”! A gimlet with lime, sugar, soda, gin, and jal-jeera (the desi part). Recipe follows. Fill a cocktail shaker with ice and pour in the gin, lime juice, jal-jeera and simple syrup. Stir vigorously with a long cocktail spoon until very cold. Strain into a chilled coupe or martini glass. Garnish with lime wheel and serve immediately. i haven’t had cumin outside of savory applications so i’m totally curious about your desi gimlet. i love gin and gimlets are up my alley, so next time i’ll add some spice to mine and see how it goes! 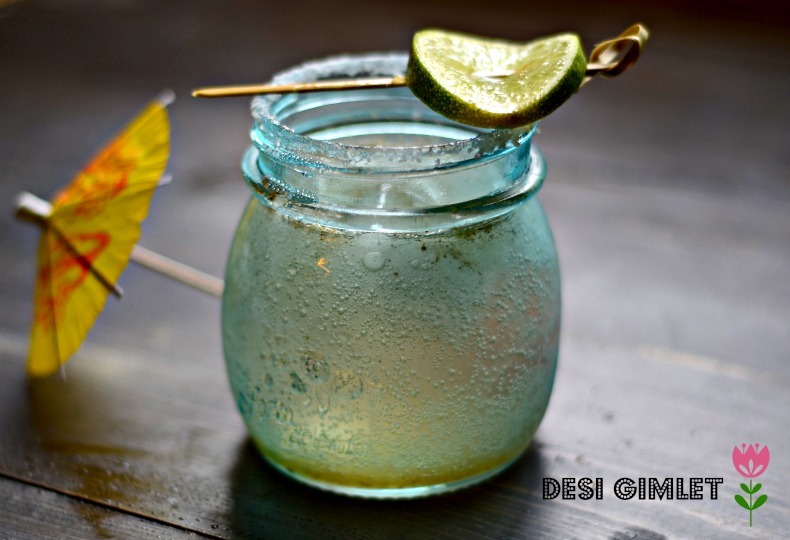 Never heard of desi gimlet before but I love lime and gin so I definitely have to try out the recipe!